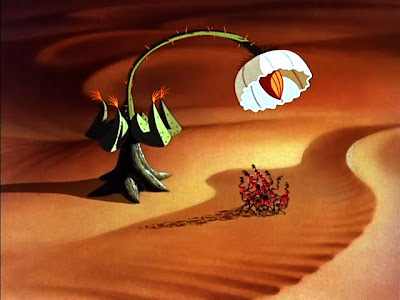 We looked at how Disney portrayed humans living on Mars in the 1957 Disneyland TV show "Mars and Beyond" but the depiction of possible plants on Mars may be even more imaginative. "[Mars and Beyond] was the most speculative program [and] it veered near the realm of science fiction with its imaginative description of possible life forms on the planet, [and] Martian weather conditions..."
You can view a clip of the program here and you can find this program in its entirety on the DVD set Walt Disney Treasures - Tomorrowland: Disney in Space and Beyond. That's bizarre. 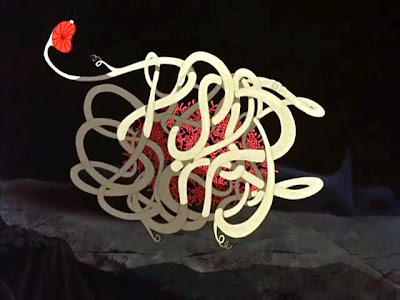 It reminds me of the French film "Fantastic Planet," which I recently saw again. How could a plant possibly benefit from eating itself? I've got this DVD. It's great. Wasn't it great when we could look forward to the future. I didn't hallucinate it! Hooray! 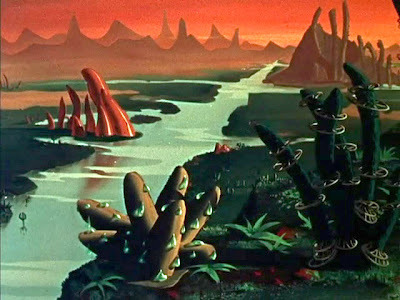 This does remind me a lot of "Fantastic Planet". And the auto-cannibalistic thingie is nuts.